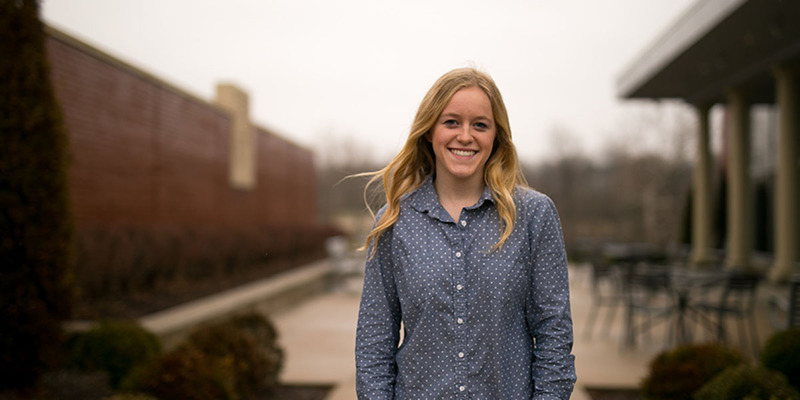 At 20 years old, Ansley Little, a Missouri Baptist University sophomore, has already qualified for three national championships for Olympic distance triathlons, once for her age-group’s World Championships, and she helped to bring the MBU track team to Nationals for the first time in the university’s history. And she’s not finished yet. She was a soccer player when she and her family moved to St. Louis from Jacksonville, Florida, in October 2012, but found the local club soccer programs to not be a good fit for her. “We decided not to go the club route and I just started running circles around the parking lot of the place where we were moving. I signed up for a couple races. My dad, he had done triathlons when we lived in Florida and when he saw that there was a sprint track, he asked me if I wanted to do it. I said, ‘yeah,’ but I had to learn to swim first,” said Little, because triathlons include swimming, cycling and distance running. At 16 years old, Little completed her first triathlon, the 2013 St. Genevieve Mini Sprint, falling in love with the competition. “I just started competing in triathlons, and by the time I graduated high school, I took a year off. During that year, I was able to compete at age-group national championships for Olympic distance triathlons,” Little said in reference to qualifying for Omaha, Nebraska’s Olympic distance triathlon, and then moving on to compete in the World Championships. Her main focus was the Olympic-distance triathlon, which is about a mile swim, almost a 25-mile bike and then a 10k run, Little explained. At the St. Louis Triathlon in 2015, Little qualified for nationals for the third time. In Milwaukee, Wisconsin’s age-group nationals to follow, she moved herself to the championships for the same distance, advancing her to World Championships in Cozumel, Mexico, in 2016, the fall of her freshman year of college. With this experience under her belt, Little’s grandfather played a part in her athletic opportunities by putting his connections to use in her favor, asking a cross country coach at a university in Georgia if there might be a scholarship opportunity there. After that news, her confidence built to getting in touch with Katie Cline Goodwin, MBU’s track coach. Ansley also reminisced to when she had just joined the cross country team. “I was coming in, having never run cross country or track before, just having done triathlons on my own and some road races and stuff. So, it was totally new to me,” Little said. The MBU women’s cross country team had never qualified for Nationals before, so they were working toward that goal, and Goodwin saw that her runners could win the NAIA XC National Championships for indoor track. Little was named All-Conference Athlete that year and the team qualified for Nationals. The cross country team’s past season had Little entering injured, motivating her to work toward getting stronger and helping her team get back to Nationals, which the team qualified for in cross country. “That was awesome, and I did get to about the exact same time that I was last year,” said Little, who overcame her injury and achieved a goal of running a personal best in the 800-meter run, while also making it to Nationals in the 4-by-800-meter relay. Her overall goal is to compete at the most elite level, the Olympic level. Little admitted that through her athletic success, she has learned strengths can also have negative sides. Addressing any possible stereotype of runners not being perceived as strong, Little pointed to both the physical and psychological aspects of long-distance running. Distance runners are constantly pushing themselves to cut that extra second while pushing their bodies that extra kilometer. “Running is like, super mental,” Little said. “On long runs and workout days you’re just constantly fighting with yourself and just like, ‘OK, I can do this workout,’ or, ‘I’ve done this distance before.’ Your body is burning, and you have to be, ‘No, you can finish it.’ It’s just really a mental battle to get through those and get through your hour and a half run or something. Through the challenging moments, Little has learned what keeps her motivated. “Something that helps me get through those is just thinking of the next race and what I wanna accomplish. So, I always give myself goals for the season and I always keep those goals in mind. When I’m at the toughest part of my workout, I tell myself, ‘OK, if you can get through this when you’re feeling this bad, once it comes to race time you’ve already practiced the hardest part so you know how to push through it, get through it and reach your goal. Little loves the encouragement that running brings. “Everyone’s super encouraging at races,” Little said. “In practice, our team’s always building each other up and always there to catch you if you fall or if you’re having a hard workout to encourage you and really just remind you of why you run. Little desires for other people to not be afraid to start running.